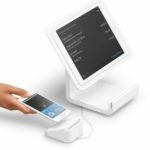 Clover and Square offer all-in-one payment processing and point-of-sale (POS) solutions for small businesses, both offering all the basic tools you need to run a brick-and-mortar retail business. While Clover has higher upfront costs with a few extra features, Square is more affordable and more flexible with hardware requirements, making it the best option for most small businesses. Square is a great choice for small businesses that want to sell in-person, whether that’s in-store or mobile. Square is the best choice for any retail business that wants an all-in-one POS and payment processing and either has a monthly sales volume under $10,000 or an average transaction size under $20. Clover is an all-in-one POS and payment processing solution. Unlike Square, which works on iOS and Android, Clover runs on proprietary hardware. Clover is more expensive than Square for hardware costs and payment processing fees, but includes more employee management features than Square, such as scheduling and payroll processing. You may want to consider an alternative to Square and Clover If you have a business with lots of inventory or multiple locations that you want to manage from a single system. If that is the case, we recommend using Lightspeed. Lightspeed has some of the best reporting and inventory management tools on the market, making it a great fit for businesses with lots of products or multiple locations. Small businesses need a payment processing solution and point-of-sale system that is affordable, feature-rich, and easy to use. The best solutions offer both POS and payment processing in one platform, are intuitive to navigate, include options for mobile and ecommerce selling, and provide data points to help inform purchasing, staffing, and other operational decisions. Price – We compared monthly software fees, processing fees, and startup costs. Payment Processing Capabilities – We looked at what types of payments each system accepts. Ease of Use – We looked at what is involved in setting up each system and how user-friendly they are. POS Features – We looked at what features are included in the basic POS system, such as inventory management, employee management, and CRM features. Mobile Capabilities – We looked at whether or not Clover and Square offer solutions for selling over mobile. Ecommerce Integrations – We looked at whether or not Clover and Square include options for selling products online. Customer Support – We looked at what type of customer service and support is included for both products. Based on the above criteria, Square is our top choice. 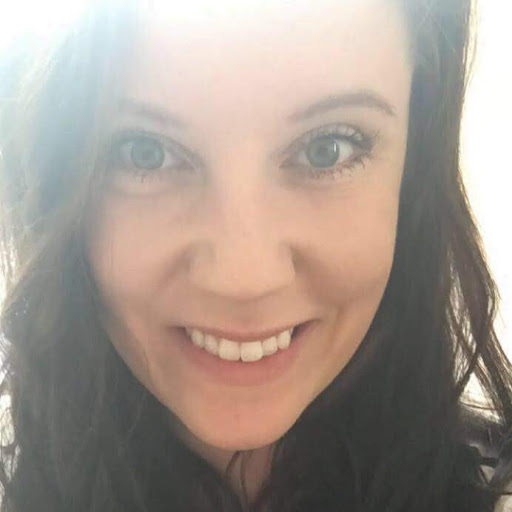 It is the most affordable option for small businesses, and it is super simple to set up and start accepting payments right away in-person, over mobile, and online. Though Clover wins over Square for certain features like employee management, overall Square is the better solution because of its flexibility and ease of use. Clover and Square are very similar in that they are both cloud-based payment processing and POS solutions. However, they differ in terms of how they operate. Square has no monthly fee or contract, so businesses just pay a flat rate for payment processing. Clover does have a monthly fee, and may have a contract depending on what solution you choose for your merchant services account. 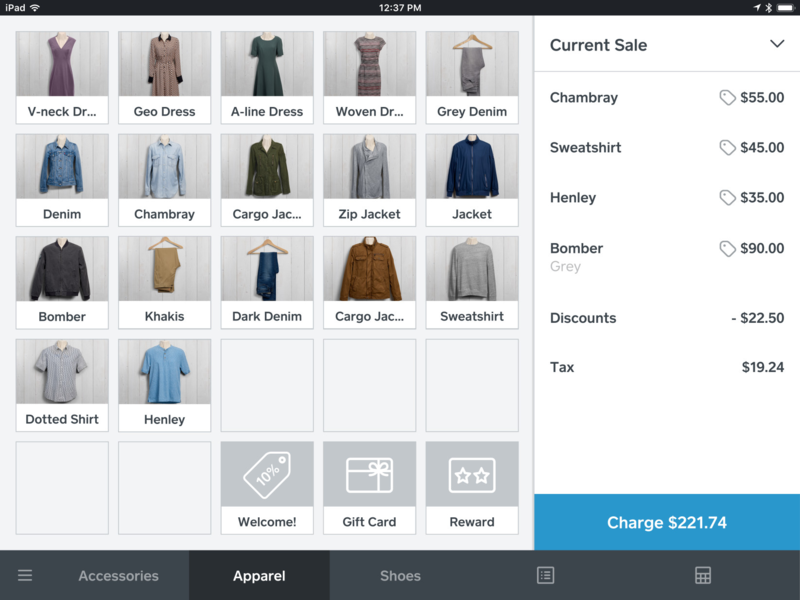 Square POS is free to use and includes basic features like a customer directory, inventory management, sales reports, and more. Clover includes similar features, just with a monthly fee ranging from $14 to $29. Square’s payment processing does not require a separate merchant services account—everything goes directly through Square. These is no application, approval process, or contract. Businesses just pay a flat-rate payment processing fee that is typically 2.75%. Businesses that use Square do not need to go through the process of setting up a merchant services account. Merchant services is included in the Square system. Payment processing fees are 2.75% unless you opt to purchase Square Terminal or Square Register, in which case your payment processing fee would be 2.6% + 10 cents per transaction and 2.5% + 10 cents per transaction, respectively. Otherwise, all Square accounts come with a free magstripe credit card reader, so you would just need a smartphone or tablet to plug it into. With Square, businesses generally receive funds the next business day. It can take longer to receive funds from transactions if you are a new account or high-risk account. Businesses can also opt to pay an extra 1% to receive funds instantly. 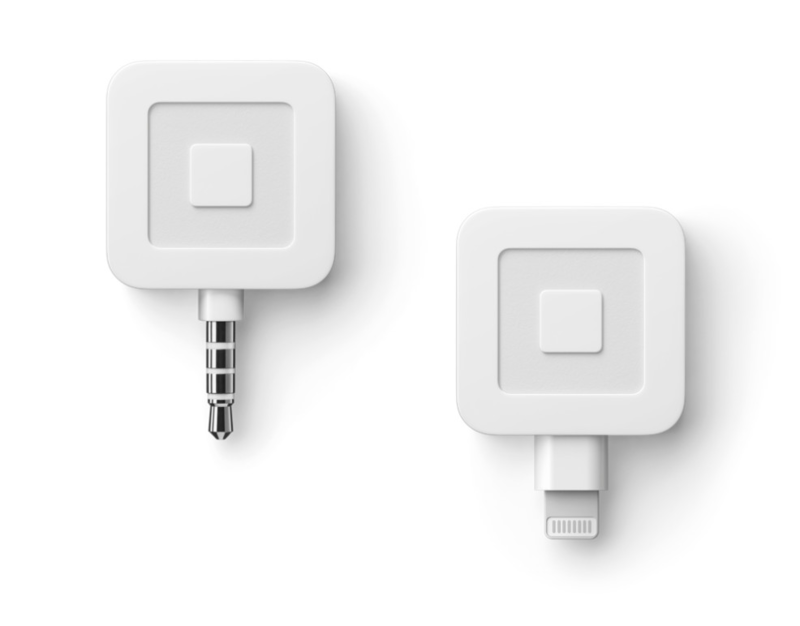 Square is what we call a plug-and-play solution. There is no application, approval process, contracts, or complicated setup. You simply create a free Square account online, your free magstripe reader will be mailed to you, and you can download the Square apps and start selling right away. The Square app itself is also very intuitive to navigate. There is no intense training involved, and employees can use the point-of-sale with virtually no learning curve. Square is one of the most flexible point-of-sale programs out there when it comes to compatible hardware. The app can be used on any iOS or Android smartphone or tablet. Businesses looking to keep costs low can get started without any hardware purchases by using the free card reader Square sends you with an existing phone or tablet. Square Stand ($169), which includes the iPad stand plus the contactless and chip card reader. The iPad is an additional $329. Square Stand Kit ($646), which comes with a cash drawer, receipt printer, contactless and chip card reader, and iPad stand. The iPad is an additional $329. WindFall Stand for Samsung Galaxy tablets ($645), which come with a cash drawer, receipt printer, card reader, and tablet stand. The Galaxy tablet is an additional $289. @Rest Stand for iPad Mini ($555), which includes a contactless chip reader, magstripe reader, receipt printer, and cash drawer. The iPad mini is sold separately. Square Register Kit ($1,529), which includes a proprietary touchscreen tablet, cash drawer, and receipt printer. The register comes with discounted payment processing at 2.5% + 10 cents. Square Terminal ($399), which is a proprietary touchscreen, all-in-one device for ringing payments and printing receipts. The terminal also comes with discounted payment processing at 2.6% + 10 cents. Square’s free magstripe reader works on iOS and Android. Square is one of the most robust mobile POS systems on the market, especially for this price point (free). Square is a favorite among pop-up vendors and food trucks because it is such a mobile-friendly system. Just plug the free magstripe card reader into any iOS or Android smartphone or tablet, download the app, and accept mobile payments. Square can also operate without an internet connection. Clover offers mobile payments, but requires a proprietary hardware purchase and a paid monthly plan. Square comes with a free basic online store. Businesses can build a more robust website through Square using Weebly, which starts at just $8 per month. Online payments are 2.9% + 30 cents per transaction, which is industry standard. Clover does not have any free solutions for selling online, but you can make a free stagnant website to direct shoppers to your store, or pay for a plug-in or for Clover Online to sell products online. Square has a built-in inventory management tool. While not the most sophisticated inventory management program on the market, it is sufficient for basic retail operations. Clover does not have inventory management built in; it costs an extra $20 per month with an app called Clover Stock. When it comes to inventory management, Square is the clear winner. However, if this is a primary concern for your business, we recommend looking into a platform like Lightspeed. Square does not have any employee scheduling or payroll features included in the free POS system, whereas Clover does. Businesses can add on Square Payroll, which allows employees to clock in and out and view scheduling, takes care of direct deposits for payroll on whichever schedule you set, and handles all of the state and federal taxes and filing. This feature is $29 per month + $5 per employee. However, Clover has employee management included in the base price. Square has phone support Monday through Friday, 7 a.m. to 7 p.m. You need to be an existing Square customer to use the phone support. There is also plenty of documentation and guides online. Ideally, point-of-sale systems and payment processing companies would offer 24/7 support, so Square’s availability is not ideal. Clover does offer 24/7 support, but that support is through First Data, which has many negative reviews about their customer service. Clover offers two different plans: Register and Register Lite. Unlike Square, which is free to use, both Clover plans have a monthly fee. Register Lite is $14 per month and Register is $29 per month. They both offer in-person transactions and payment processing, employee management, and 24/7 customer support. Unlike Square, which always uses Square payment processing, Clover can be used with different processing companies. If you buy online directly from Clover, you will be working with First Data. However, you can also purchase through banks and other providers. While this offers businesses more flexibility in finding a lower rate, it also makes the application, approval, and setup process a little more complicated. For the purposes of this article, we’re assuming that the Clover system is purchased through First Data at Clover.com. Clover offers in-person and mobile payment processing with competitive rates. Similar to Square, businesses receive funds from transactions in one to two business days, depending on your financial institution. Like Square, Clover can also process cards offline. Aside from the complications of being approved for a merchant account and getting that set up, the Clover system itself is pretty sleek and intuitive. It has a home screen from which you can easily navigate to features including sales, employee management, and inventory. Like Square, Clover does not require any intense training or have a significant learning curve. Hardware is one of the areas where Clover POS and Square POS really differ. Square is an app that can be downloaded for free on virtually any iOS or Android smartphone or tablet. Clover is a system that comes pre-programmed on specific Clover devices. You choose between Register and Register Lite at the time of purchase. There is no flexibility, meaning Clover requires a larger upfront investment. 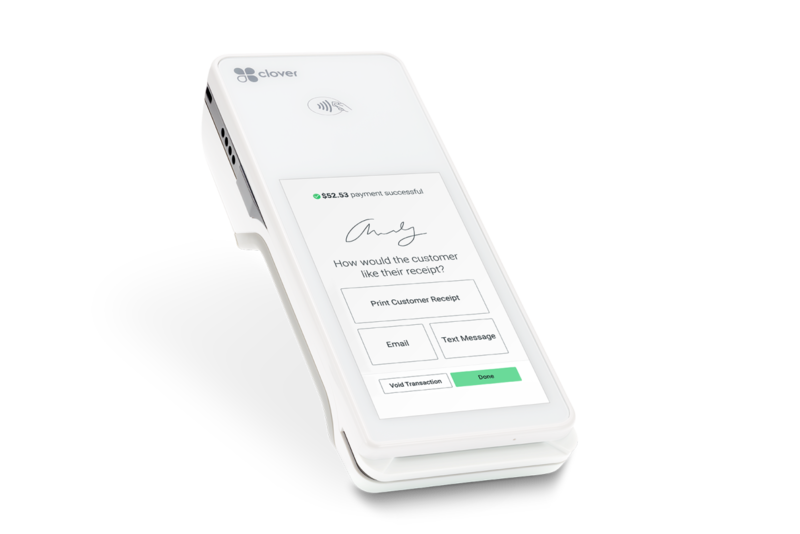 Clover Flex ($449), which is a handheld system for mobile and in-person payments. It offers payment processing, receipt printing, and barcode scanning, all in one device. 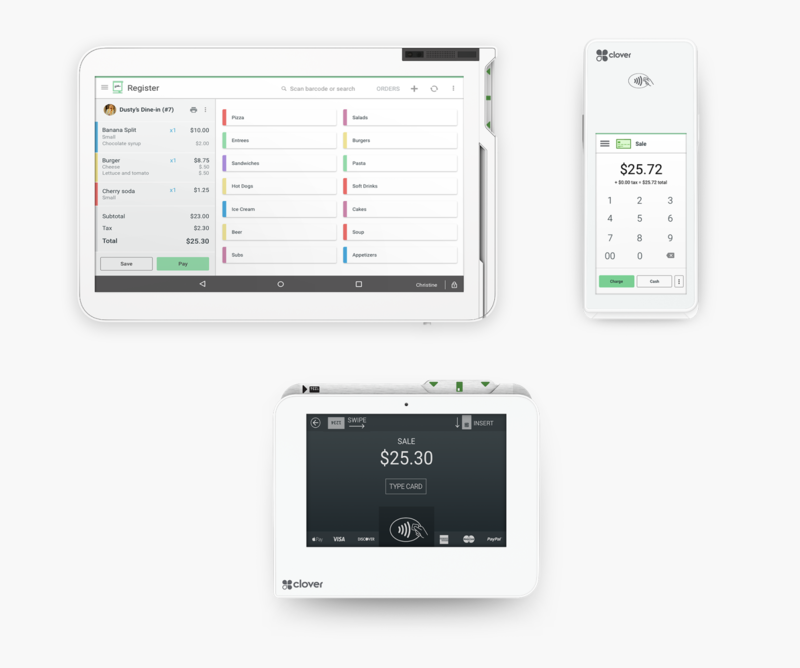 Clover Mini ($599), which is an all-in-one countertop system for payment processing, employee management, and viewing reports, as well as for restaurants and managing floor plans. Clover Station ($1,199), which is a larger countertop display with payment processing, managing operations, and viewing reports. The larger screen pivots to be employee-facing or customer-facing. Clover Station with Customer Mini ($1,499), which includes the same larger screen and a smaller customer-facing screen for accepting payments. Clover Go ($59), which allows you to accept swipe, dip, or tap payments from your phone. Clover Flex for in-store and on-the-go payments. Clover offers mobile payments with the Clover Go ($59) device. Clover Go accepts swipe, tap, and chip payments at a 2.7% + 10 cents rate. The Go device pairs with a cell phone or tablet via Bluetooth and offers paperless receipts. Square is the clear winner for mobile, as businesses have access to a complete mobile POS for free, and can accept mobile payments using the free magstripe card reader. Even if you are only looking to process mobile payments, Clover requires you to sign up for either Register or Register Lite when purchasing Clover Go. Clover does not come with any ecommerce capabilities. They can be purchased through third-party apps such as Pointy in the Clover marketplace. Or, businesses can sign up for the separate Clover Online. The plan that includes an online store is $29.95 per month. If you’re looking to sell products online, Square is the better choice because it has a free basic store and robust custom sites available for a little as $8 per month. Clover has basic inventory management included in the Register plan, but more robust inventory management is available through an extra app called Clover Stock, which is $20 per month. Square is the winner for this feature, because the free program includes basic inventory management. However, if this is a primary concern for your business, we recommend looking into a program with more in-depth features such as Lightspeed. Clover includes a free employee scheduling and payroll system with both the Register and Register Lite plans. With Clover, employees can clock in and out, view schedules, swap shifts, and message each other to swap shifts. With Square, none of these features are included in the free version. Businesses would need to pay for Square Payroll, which starts at $29 per month + $5 for each employee. Clover tech support is 24/7, which is ideal for a payment processing company, and especially for retail businesses that get a lot of traffic on the weekends. Square only offers support Monday through Friday, 7 a.m. to 7 p.m. However, Clover’s support is through First Data, which has notoriously poor customer service as it is such a large company. Neither Clover nor Square really excel when it comes to customer support. With Square, all aspects of payment processing are done directly through Square. With Clover, businesses can use First Data as the payment processing solution, or use other merchant services providers like Bank of America, Dharma Merchant Services, and Payment Depot. This means you can potentially shop around for a better rate, but it also means you are more likely to be locked into a contract. With Square, everything is much more transparent and straightforward, and there are no contracts. Everything is directly through Square—no other merchant services accounts. Includes in-person, mobile, and online payment processing solutions. Flat-rate processing fees (through First Data). Funds within one to two business days. Flexibility with choosing a merchant account. Potentially locked into a contract. In-person and mobile processing; online available through extra subscription. Ease of use is so important for small and startup businesses that don’t have time or funds to invest in costly installations or training programs. Square is a plug-and-play solution, meaning businesses can start processing payments right away. Clover requires an application and a bit more setup, but overall, the systems themselves are both pretty user-friendly. Choice of iOS, Android, and proprietary touchscreen devices. Intuitive navigation and sleek design. Download Square app right from the app store. Back-end features are also available through the website. Square’s intuitive app works on many devices. Choice between mobile and hard-wired connections. All features are available through a sleek homepage. Choice of Clover’s user-friendly devices. Customer service and support is critical when dealing with a system that is operating as your business’ point-of-sale and payment processing solution. Both Clover and Square include free phone support. However, both require you to enter your merchant ID before speaking with someone. 7 a.m. to 7 p.m. phone support available. Lots of how-to’s and documentation available online. Detailed articles and Q&A on their website. Clover and Square both have a ton of reviews and feedback available online, as they are both pretty popular systems. With both Clover and Square, reviews are very positive for the actual systems and software. Overall, reviews for Square are very positive. Users like that Square is super easy to use and can get started right away. Business owners also like that there is no contract and no monthly fee. Most negative reviews report trouble with customer service, including limited hours. Visit our Square Review Page for more information. Clover reviews are generally positive. Business owners like that the software is easy to use. Some users don’t like the upfront costs that come with Clover or the required proprietary hardware. Others report negative experiences with customer service provided through First Data, which is a very large corporation. Visit our Clover Reviews Page for more details. Overall, Square and Clover are both great options for an all-in-one payment processing and POS system. They both offer flat-rate payment processing, are generally affordable for small businesses, include basic business management features, and are super easy to use. However, Square is the best option for businesses looking for an all-in-one payment processing and point-of-sale solution. Square is free to use and can be used with any iOS or Android smartphone or tablet, so there are minimal upfront costs. Plus, Square includes options for in-person, mobile, and online sales with no contract or monthly fee. Click here to create your free Square account today.